Daniel has been working with KickStart Ghana since their conception in 2008. A keen football fan, Daniel is head coach of Dynamo FC (a local football team that KickStart Ghana works with) as well as being on the board of the Volta Region FA. He is employed full time by KickStart Ghana. Having been resident in the Ho area for the majority of his life Daniel has great local connections and is responsible for ensuring that the work that KickStart Ghana undertakes is relevant and of importance to the community. He has been involved in volunteer activities for over ten years and is a keen believer in the positive effect that volunteers can have on the world around them. A big Ghana and Arsenal fan, Daniel would like nothing more than success from his two teams over the coming season! 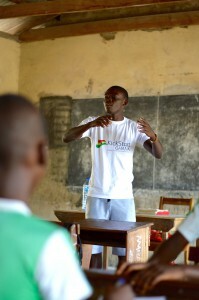 Coco has been a volunteer with KickStart Ghana since 2010. His passion is being to help of people and this has made him a vital member of the team. I.T. is his dream career and he is currently studying this at university. He also loves playing football and is a massive Barcelona fan. Being the Volunteers Coordinator in Ghana, his job specification is to make sure the volunteers have the perfect conditions to carry out their work and make sure they make an impact through the donation of their time. Coco is a happy person and what he wishes and hopes for is to be able to inspire others by showing commitment to the KickStart Ghana mission and vision. Rachel has been volunteering with KickStart Ghana since taking part in a cultural exchange with a school group in 2014. Her role is to ensure the charity runs smoothly. She organises and record decisions at board meetings, takes minutes, keeps the records and assists Daniel in his work. Rachel is a passionate volunteer who wants to ensure that young people the best education possible before leaving school. Divine has been on the KickStart Ghana board since 2015. Having understood the ultimate motives behind the existence of the organisation, he realised the need to be part of helping the NGO achieve its vision. He feels that KickStart Ghana has been fantastic with their life transforming work so far and he’s enjoying witnessing the good things that the NGO has completed so far. He’s privileged to be part of this. Divine’s role is to work with our local projects to ensure they are running smoothly and making an impact. 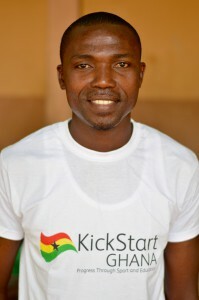 Outside of KickStart Ghana he is a footballer and a minister of the gospel of the Lord Jesus Christ. He is also a passionate soccer fan who supports Manchester United. Prince has been working with KickStart Ghana since 2010 and currently is a graduate from Ho Polytechnic, studying Banking and Finance. He is a big Manchester United fan. Prince has been playing for Dynamo FC since its inception in 2006 and is now part of the men’s team. 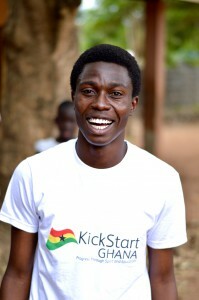 His role as part of the KickStart Ghana team is Deputy Projects Coordinator in Ghana. He supports Divine, working with KickStart Ghana projects to ensure that they are being run to a high standard and helping achieve the charity’s goals. Prince volunteers because he has seen the the work that KickStart Ghana has done with Dynamo FC and he wants to contribute to society in the same way that he has been helped. David has been a regular visitor to Ho since 2006 and has served as Volunteer Coordinator for KickStart Ghana during the summers of 2010 and 2011. A Masters Graduate from the University of Birmingham, David is keen to promote equal opportunities in education and sport for children throughout Ho and the Volta Region. A big sports fan, David is a dedicated Watford supporter and is a big believer in their approach to work in the local community and youth development. David’s hopes for KickStart Ghana over the next 12 months are to build on the fundraising work currently undertaken in the UK and also to develop the quality of our volunteers’ work in Ghana. 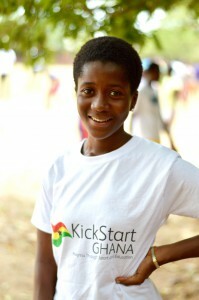 Ruth has been volunteering with KickStart Ghana since 2009 in various roles. She now leads on monitoring and evaluation, helping the board in Ghana ensure our work makes a difference. Outside of KickStart Ghana she is passionate about young people making a difference, responsible overseas volunteering and enjoys going to live gigs. Her full time job is at Amnesty International UK as their Youth Programmes Manager. 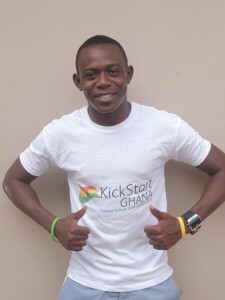 James has been involved in KickStart Ghana since near the near the beginning, having joined in 2010. His skills as a qualified accountant have been essential in helping with the financial aspects of the charity. James helps prepare the end of the year accounts and offers strategic help to the charity. James has a keen interest in travel and has been across the world and back again visiting Asia, Africa and Australasia. He is also a sports fanatic both as a participant and spectator. Sarah is responsible for marketing KickStart Ghana in the UK. She runs our website, writes newsletters and promotes the charity in many other ways. She also helps with our community fundraisers. Sarah’s full time role is in marketing at Cancer Research UK, having previously worked in higher education. Sarah is a regular member of the KickStart Ghana softball team and an excellent baker! David first volunteered in Ghana in 2006, coaching football and running play sessions at a local Kindergarten. He has several years experience in the voluntary and charity sector working for YouthNet, the charity behind Do-it, Greater London Volunteering and currently, the London School of Economics as their Volunteer Coordinator. David is keen to see KickStart Ghana continue developing links with the local community and to ensure that as many young people as possible have the opportunity to receive a good standard of education. He also enjoys watching and playing football in his spare time, and has a season ticket at Tottenham Hotspur.